This pet urn is handcrafted in the United States of genuine hardwood with a high quality lacquer finish in cherry, oak or walnut. The bottom of the urn has a removable panel with brass hinges so the cremains can be enclosed. 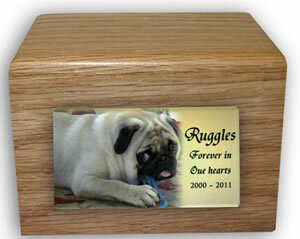 The urn has an engraved plaque that can be personalized with your pet's name and dates. Or, a color photograph can be baked on a metal panel for the side of the urn. This beautiful urn is designed for placement indoors. 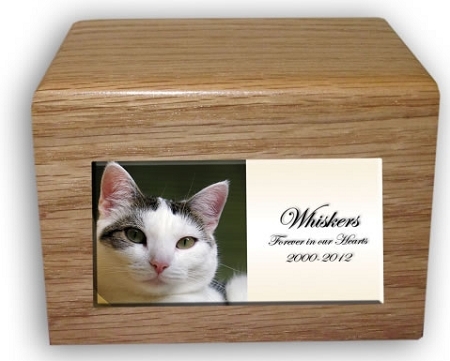 Two options are available with the cube-style pet urn. See the Image Gallery for examples. 1) Photo is baked on a metal plaque, along with text. That plate is larger. 2) Text is engraved on a metal plate. That plate is smaller. 4" x 3" x 3.25". 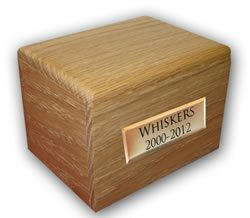 Holds cremains for a pet weighing up to 10 lbs. - If a photo is used: Image and text are displayed on a 3" x 2" plate. Up to 25 characters of text (including spaces) can be added. - If only text is used, the brass plate is 2.5" x .5". 5" x 3.25" x 4". Holds cremains for a pet weighing up to 25 lbs. 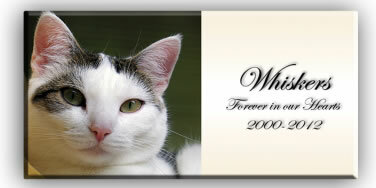 - If a photo is used, image and text are displayed on a 4" x 2.25" plate. Up to 50 characters of text (including spaces) can be added. - If only text is used, the brass plate is 2.5" x .5". The text-only plate holds up to 25 characters of text (including spaces). 7"x 4" x 5". Holds cremains for a pet weighing up to 50 lbs. - If a photo is used, image and text are displayed on a 6" x 3" plate. Up to 100 characters of text (including spaces) can be added. - If only text is used, the brass plate is 3.25" x 1.25". The text-only plate holds up to 30 characters of text (including spaces). 7.5" x 5" x 5.5". Holds cremains for a pet weighing up to 100 lbs. - If a photo is used, image and text are displayed on a 6.5" x 4" plate. Up to 150 characters of text (including spaces) can be added. - If only text is used, the brass plate is 3.25" x1.25". The text-only plate holds up to 30 characters of text (including spaces). 8" x 5.5" x 6". Holds cremains for a pet weighing up to 140 lbs. - If a photo is used, image and text are displayed on a 7" x 4.5" plate. Up to 200 characters of text (including spaces) can be added. - If only text is used, the brass plate is 3.25" x 1.25". The text-only plate holds up to 30 characters of text (including spaces. After placing an order, email the text and photo (optional) to us. On the email's subject line, enter your Order Number. (Example: "Order 1234 - Photo & Text Attached). If you want to use a photo, send a sharp, clear photo that is scanned at 250 dpi or more. The original photo should be at least 3x5. (If you need help on that, just give us a call.) We will crop the photo so you don't need to worry about modifying the photo. 2. Email the text and photo (optional) to us. Please include your Order Number on the subject line so that we can associate your text with your order.